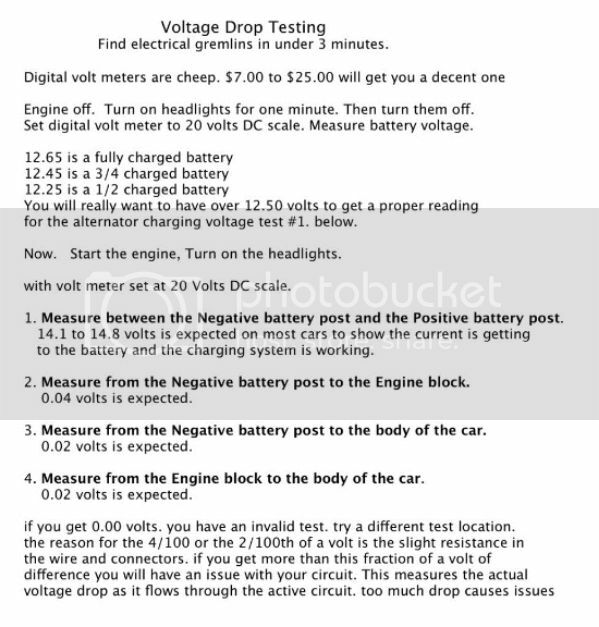 this test takes about 2 minutes to do.. and will tell you if you have bad ground wires or dirty terminals... this is a voltage drop test.. it can only be done with current running through the wires..
if there is a difference in ground.. you will see a voltage on the meter..
you might also want to make sure that your battery cables are totally clean..
it is also possible that the alternator or voltage regulator is on its way out..
Had the same problem on a 1993 Corvette. We found that the wire from the alternator to the battery had burned through near the fuseable link behind the battery. The link did not blow and there was only a few strands of wire still in tact. Testing the wire with an ohm meter showed the wire to be good between the alternator and battery but the wire was not able to handle any amps so then the alternator kept rising the voltage up. We repaired the wire and everything worked properly. My 1986 Corvette with the digital dash has the same issue. I read 15 - 17 volts upon start up, and will then black out the dash lights when it hits 17 volts for 5 minutes and then come back on and show 13.7 volts and stay like that until I turn the car off, then it begins all over again. I changed the Alternator with Voltage Reg and that didn't fix it. I cleaned the battery cables and then checked the voltage between the neg battery cable and chassis ground and got .01 volts (Normal). The check engine light does not turn on. Did you ever find the problem with your car? open hood... turn digital volt meter to 20 volts DC setting..
post what you get... you really should do the tests with a battery above 12.4 volts after you remove the surface charge..
1. test between the positive battery post and the negative battery post... 14.1 to 14.7 volts is expected..
2. test between the Negative battery post and the engine block... 0.04 volts is expected..
3.. test between the negative battery post and the body of the car.. 0.02 volts is expected..
if you have a dirty connection.. a loose connection.. when the circuit has a load on it .. (engine running, headlights on) if there is a restriction/resistance between the various parts of the car.. you will be able to measure the slight difference as 0.02 or 0.04 volts DC... if you get more than that.. and i have run across cars that have 8.5 volts on test #4.. you will easily be able to isolate the problem..
i am also expecting to find that your alternator back looks like this..
Hi there, I'm having the exact problem on my 1986. Did you ever find the fix? they never came back.. but i gave them proper diagnostics to find the issue..
then measure alternator output terminal to the battery positive terminal and post that number also..
this is a JPG image so it should be easily printed..
add test 5... engine running.. headlight on..
positive battery post to the alternator output terminal..
you will also want to check from this terminal block behind the battery tray to the positive battery terminal. less than 0.1 volts..
please post results by number and i can decipher them..